Well! I’m afraid we’ll be hit with stranger/separation at some point in the near future, but Tucker acquitted himself *beautifully* over Easter weekend. We were down at my mother-in-law’s house, and there was a big family gathering (25 people or so) on Saturday. Tucker was passed from aunt to uncle to aunt to cousin all day, and never fussed or made a scene. He was so patient and calm! And on Sunday after church we swung by a big Greek Easter gathering to see some friends and check out the 38-pound lamb roasting on a spit (omg yum), and once again Tucker allowed every aunt and yaya to cuddle and hold him. He did spit up prunes on our friend’s sister, but she didn’t seem to mind much. The lovely thing about a visit to family is all the help. Ben’s mom took Tucker on Saturday morning after I fed him, and we got to go back to sleep until....drumroll...9:30! Amazing. He wasn’t sleeping very well—last week’s fever turned into a nasty cough for a few days, and he was waking up a couple times a night—but overall things went great. It’s just hard when you’re in a house with a lot of people who don’t remember that stomach-clenching fear of waking the baby, you know? Keeping the noise levels down was a real challenge. Back at the ranch, we have a new player in the nursery. After trying out the Skip Hop PlaySpot for a month or so (to recap, I loved the look, loved how soft and smooth it was, didn’t love how the pieces gap apart a bit while you sit on them), I started poking around to see what other formamide-free options I could find to compare. A site called Safbaby.com has contacted the major floor mat manufacturers and asked them for copies of test results showing the levels of formamide in their mats. They have a chart you can download with the results, and it makes it easy to figure out which companies have the safest mats. 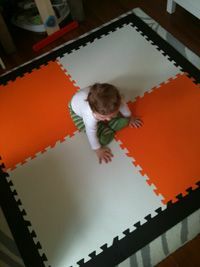 That led me to SoftTiles, a company that makes foam flooring for preschools, trade shows, etc. Their basic tiles come in two-foot squares, which are $5.80 each and come in a bunch of colors. They also have one-foot squares in solids and alphabet and number options. The edging pieces ($1 each) taper down so they are floor level at the outside edge, reducing your risk of tripping when you walk onto the mat. You guys. They sent me a batch of the big tiles and edging (I chose orange and white tiles with a black border) and I laid out half to make a square mat in the nursery. First of all, I think it looks amazing (see photo). I really love the puzzle edges, which fit really tightly together, and the giant tiles, which meant it took about 2 minutes to set up the mat. The foam is firmer than Skip Hop’s, and the texture is rougher. It’s definitely not as comfortable to press your hands into—you get a basket-weave pattern on your palms. But it feels really sturdy and makes for an amazing play surface. There’s a photo on the website of a (huge) playroom in the orange and white—they covered most of the floor and it looks so great. If you poke around the site there are some pretty cool suggestions for things to do with the tiles, including making fun patterns using a combination of tile sizes . I could see the tiles being a perfect choice for a basement rec room where bigger kids are really tumbling around--I’m thinking of ordering one more white tiles so that I can make a big 3x3 square for the empty part of the living room when Tucker’s friends come over. Ok, advice time. I have to ask if anyone has insight into what might be going on here: Tucker’s been arching off the pillow and screaming while nursing. Usually it’s after 5-7 minutes on the first side; he fusses until I put him on the other side (fine, that makes sense), and then after 2 minutes on the second side he does it again. Sometimes he latches back on (on side one, anyway), other times he is DONE. He’ll calm down if I just let him play, but if I rotate him back into nursing position he freaks out. It’s not a supply thing; there’s still lots of milk left, especially on the second side. More teething pain? I think a tooth on the side is working its way through but he’s awfully defensive of his mouth and I can’t really tell.